I started out with four pirates guarding the sump, with six more starting off the board. The cultists attacked in three groups of four. The cultists appeared from the gloom of the underhive and rushed towards the sump, hugging cover as they came. 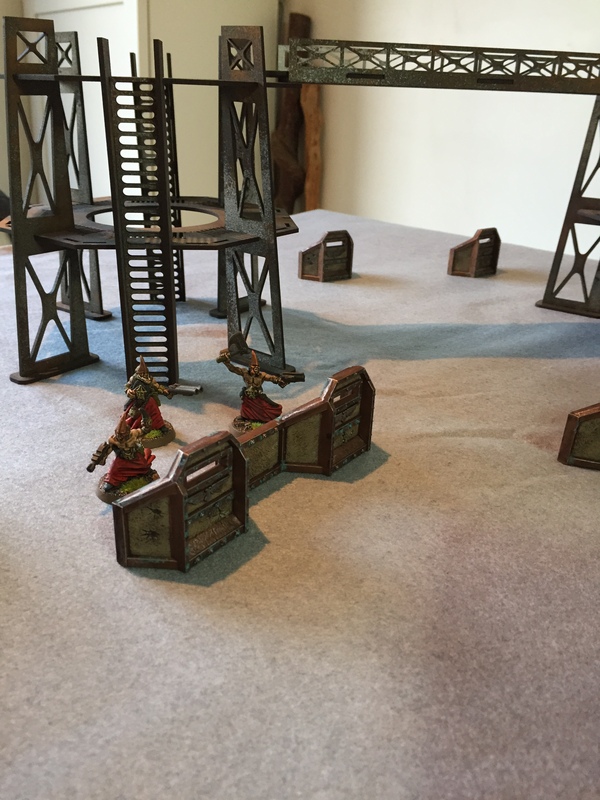 There was no fire from the mob, as they were mostly armed with pistols, but the pirates on the sump started to take pot shots, managing to drop a couple of cultists as they closed. Meanwhile, the rest of the pirates were alerted by the shooting and rushed to support their crewmates. 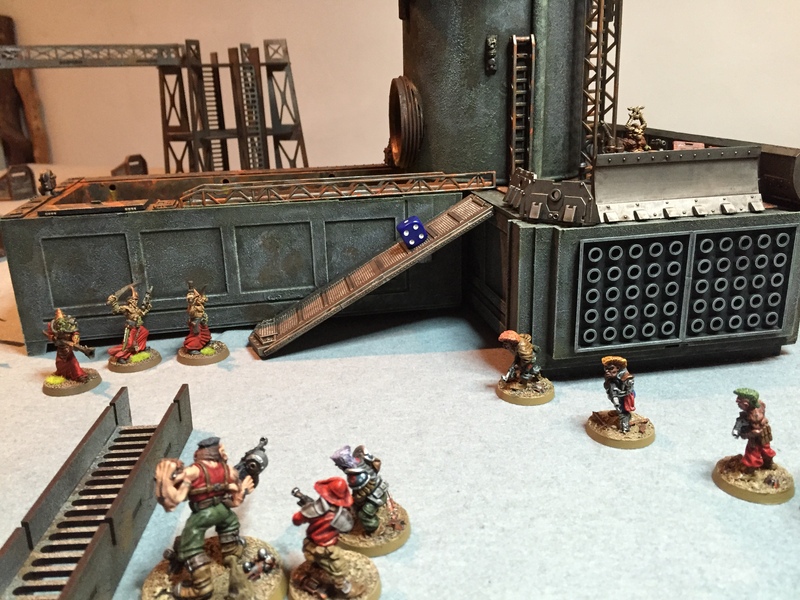 The race was on – could the reinforcements get there before the cultists could overrun the facility! The shooting intensified as the cultists drew closer. 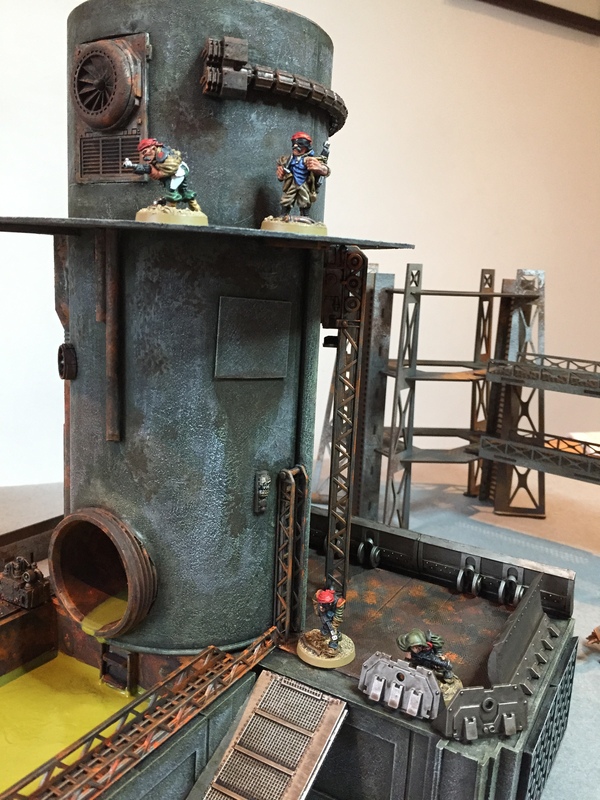 It took the cult leader a few turns to figure out how to make his shotgun work, but once he did he and his squad started to whittle down the defenders on the sump tower. 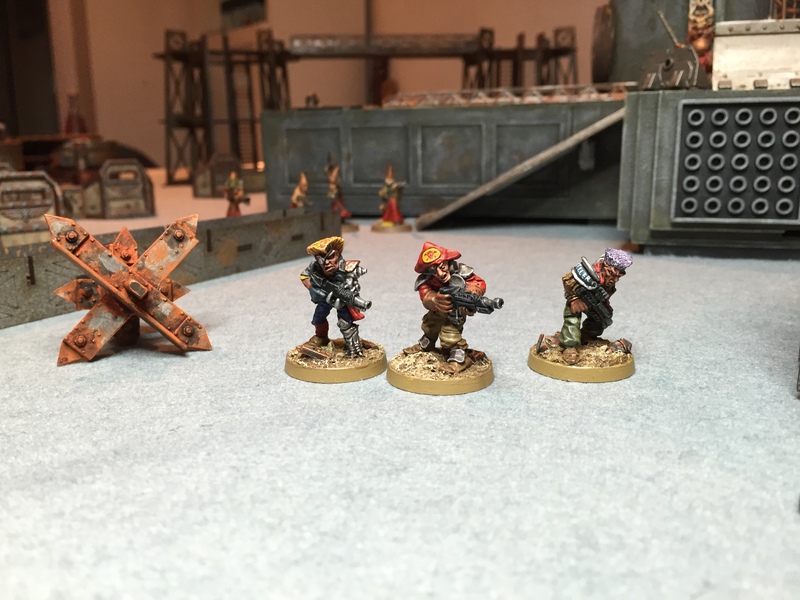 More cultists took advantage of the covering fire and rushed towards the sump access ramp, where they gunned down another defender – the sump was left in the hands of a lone pirate champion! Meanwhile, the rest of the pirates had almost reached the sump. The pirate captain directed his Ogryn bodyguard and another squad mate to fire on the cultists closest to the ramp. 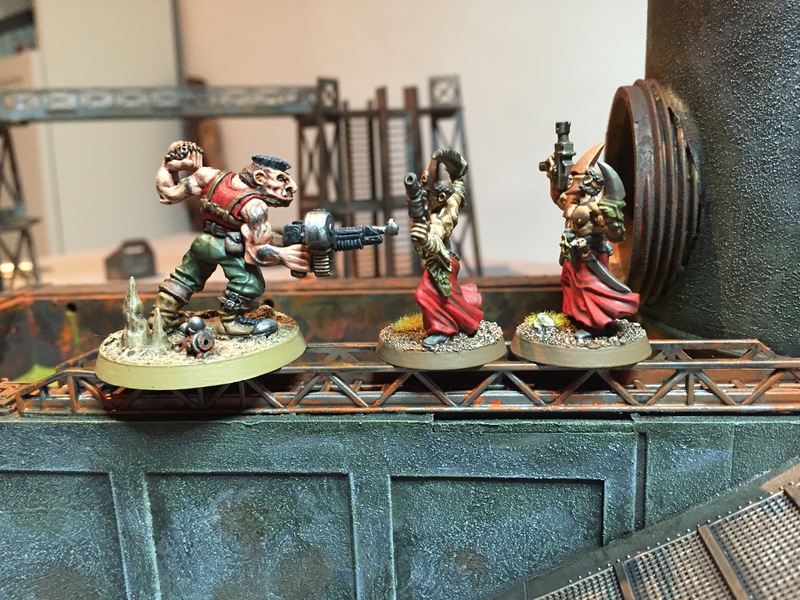 Two of the screaming fanatics went down, but the captain had a nasty surprise when a warp entity tore itself into reality via the corpse of the cultist champion… a slavering red Daemon promptly charged the captain! A flurry of blows was exchanged, and the Daemon was forced back, (helped by the captain’s Ogryn bodyguard piling in!). Meanwhile the final squad of cultists rounded a corner and took an opportunistic shot at the group, one of them setting the Ogryn alight with a flamer. The final squad of pirates tried to thin out the cultists milling around the sump with weapon fire, but with little effect – no doubt they were distracted by the sight of a daemon bursting from a dead body, and the enraged bellows of a burning Ogryn. The remaining cultist from the squad that spawned the daemon made his way up the ramp. 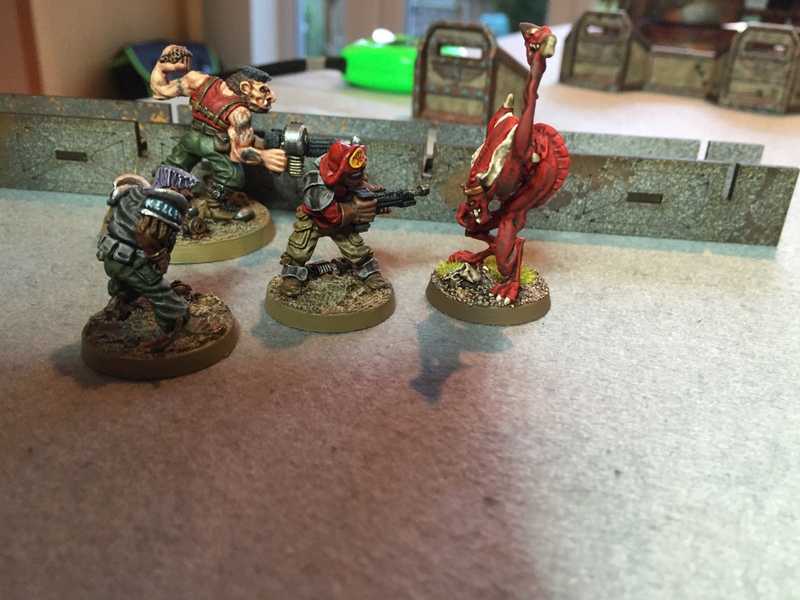 The mutant beastman was almost there – a lone defender stood between him and his goal. The pirate champion heroically charged the abhuman but failed to wound the creature. The beastman lined up a thunderous headbutt and dropped the pirate – the way was clear! The creature snorted in triumph as he reached his objective… and then looked in puzzlement at the mechanism he was supposed to be sabotaging – intelligence test failed! Meanwhile, the captain and his human squadmate managed to beat out the flames on the burning Ogryn, and then they finished off the Daemon as it bounded back into combat. 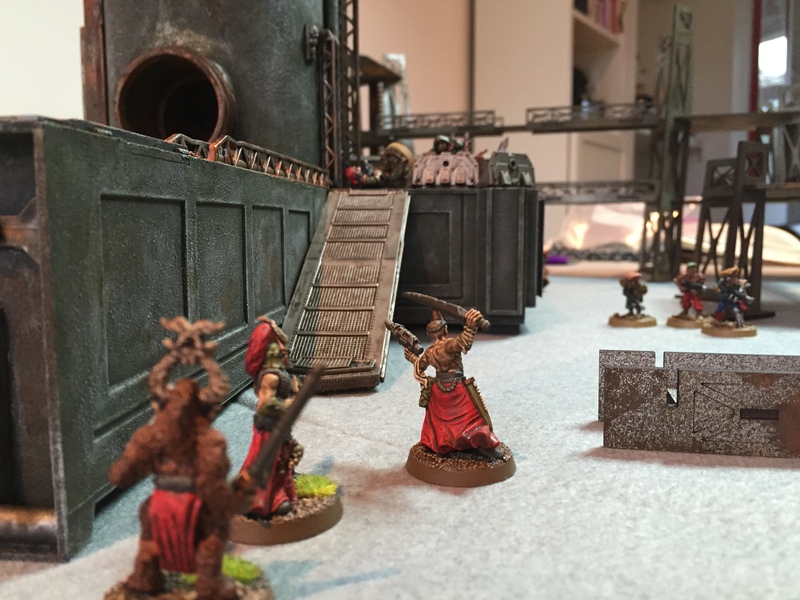 The other pirates tried their best to pick off another pair of cultists as they ran up the ramp to help the intellectually challenged beastman, but they couldn’t hit a barn door. The death of the Daemon meant that the captain and his unit were now free to act, and 40 stone of angry smouldering Ogryn thundered up the ramp and pounded the two cultists into the ground, before glaring up at the beastman who was still trying to figure out how to sabotage the mechanism. The remaining pirates piled in to the cultists milling around the base of the sump, but to little effect. It all came down to the chaos beastman… he did his bestest & hardest thinking, and in a flash of inspiration, he thunked out how to foul up the mechanism and dump thousands of litres of toxic sludge into the drains. Job done, he calmly turned to confront the Ogryn who was charging up the ramp, looking for some payback. He snapped off a shot, and was delighted to see the Ogryn drop to the floor with a puzzled look on its scorched face. The pirate captain decided that enough was enough – outnumbered and outgunned, he ordered his remaining crewmates to ‘tactically withdraw’. 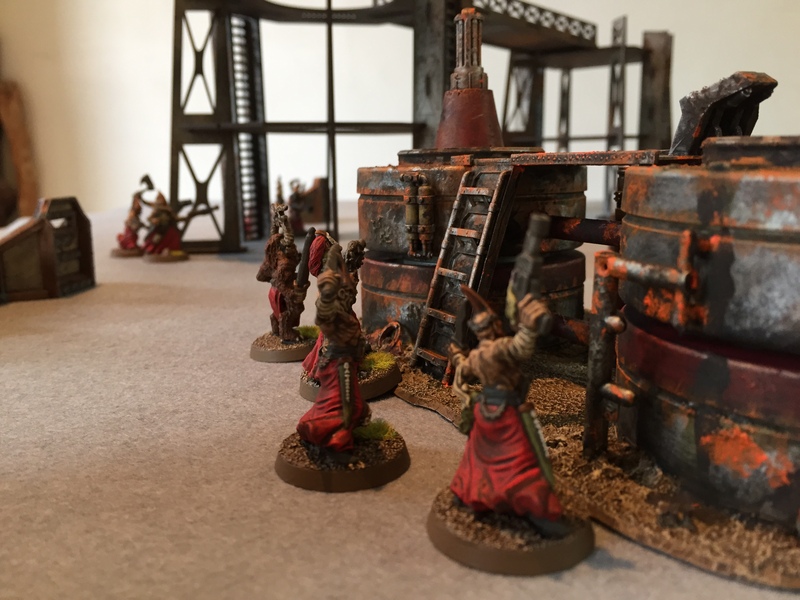 The cultists had doggedly achieved their aim despite losing two thirds of their number in the process. Well, that was a whole load of fun! The Rogue Trader rules are a little clunky at times, (working out all the modifiers for different blokes & weapons), and the book is a bit disorganised, but that only served to add to the creativity and fun. There were several points that were open to interpretation, so we just rolled for stuff or made things up on the spot. 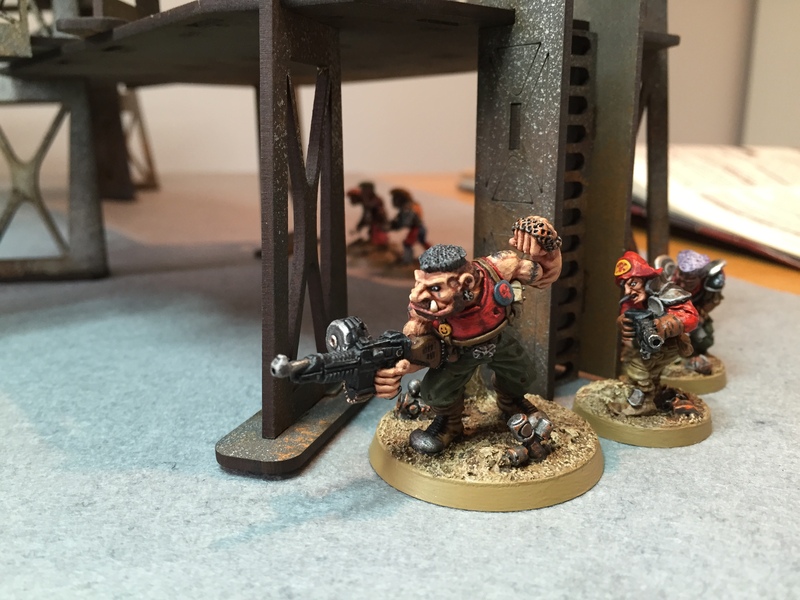 Without realising it, we were both playing to have fun and tell a story rather than kill stuff and win… a very pleasant change from modern 40k. 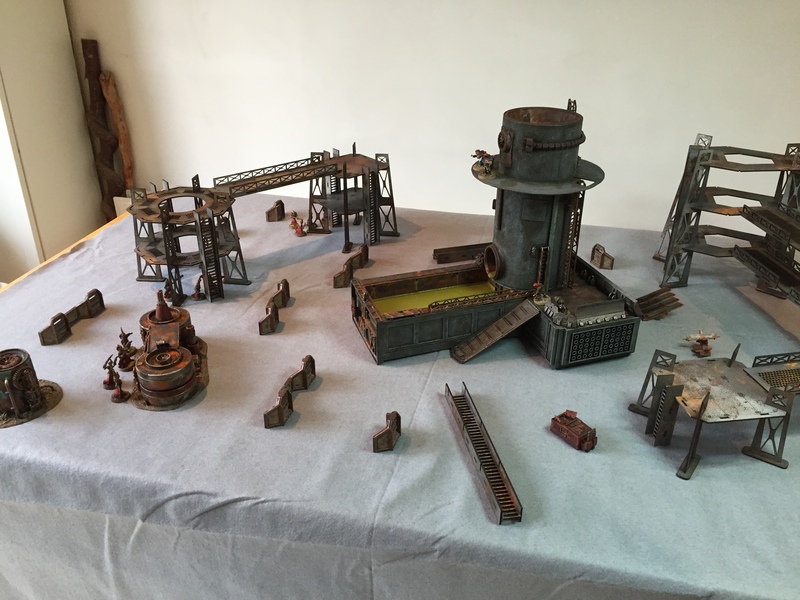 Another thing I really enjoyed was the small model count – this is great, as it means that the game is easy to get into – it doesn’t need to cost much, is quick to paint, and is much more character driven. Ross and I both went with old lead miniatures, but you could easily do this with modern plastics at a much lower price. Try it – you might like it! great game, thanks for sharing! buy that beastman a pint!